Quoits is one of the most famous traditional outdoor games for parties. If you haven’t tried it yet, you’re missing out on a lot of fun. Basically, the goal is to throw and shoot the rings into (or as close to) the upright pegs to score. It can be a one-on-one, or competitive team game. It’s great for birthdays, team building events, graduations, barbecues, and other outdoor celebrations. With this game, your guests will surely be occupied for hours! You’ll never get bored. Let out your competitive side and be the Quoits champion! By providing such amazing games, your party will be the envy of everyone. Plus, it’s very kid-friendly and suitable for all ages! You can set it anywhere with enough open space - in your garden, yard, or lawn. If you’re renting a venue, that’s good, too. Order now and see your next party come to life! The game comes at the low price of £15. 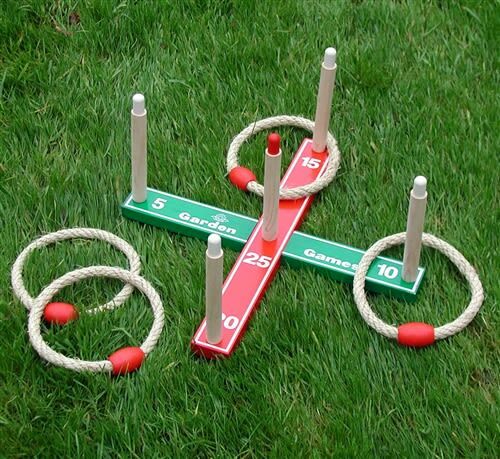 You can also see our other garden games to complement your party. Do think of our games for your next event! Find out more about ordering by calling, or sending us an email. Feel free to leave a message on our Contact form.